I am glad I did not purchase this book when it was first published, with all the marketing hype and I am not even sure still why the title "Ghana Must Go". To make matters worse, firstly, I have not read any novel so far with so many short sentences, sometimes even without an action word, the verb, making my reading experience somewhat disengaged and I struggled through the first (not few) pages. Secondly, there is a lot of going to and fro in a confusing way. For instance, it goes without saying that the narrative of pieces of memory combined with actuality could be poetic, artistic and different, however, requires effort to comprehend.Thirdly, I dislike all of the characters, none of them has stamina. the best, if not the best in his field. He meets Fola, from Nigeria, who becomes pregnant with Olu their first son and at that moment she decides to renounce her dreams of going to Law school (first mistake) where she has been accepted. Of course, they had three more children together, she resorts to selling flower while Kweku becomes a doctor. Something happens and Kweku is fired, he did not tell his wife (second mistake), instead pretends he still has a job (third mistake) for a whole year after which he feels so much shame and decides to abandon them all and run away. That is when they all start to fall apart. Do not think the story is presented to you on a silver platter. No. You will have to struggle through short sentences, with or without verbs, flashes of memories going to and fro. Just be ready. There is no doubt that Taiye Selasi is a brilliant writer, perhaps, she is not simply the type I take pleasure in. I find her narrative style complicated and confusing, though poetic. Have you read this novel? Did you enjoy it? Hey! Long time, yes, it eventually gets better compared with the beginning. I'm surprised you didn't like it. I really, really enjoyed it. It's all good though. What are you currently reading? I really tired to like it, however, I couldn't. I am currentl reading Palace Walk by Naguib Mahfouz. 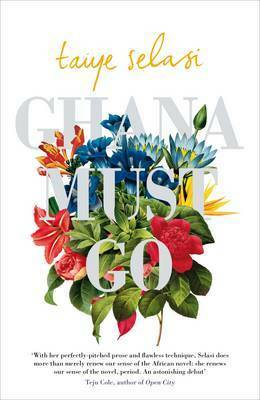 I liked Ghana Must Go a lot, but it seems like there are many people who didn't. The funny thing is that my experience was the opposite of yours, I loved the beginning and didn't like the ending as much. I think I come acroos people who either liked it or did not at all. I must admit, it is a weird book... different. I am a dedicated reader to the point where, no matter how difficult, I try my utmost best to finish a book. Unfortunately I could not get past the first part of this book. I was lost, confused, frustrated and simply working too hard to figure out the story to enjoy it. I get enough of those emotions in my day to day life that I don't want to repeat that when I am engaging in my favourite pastime (reading) lol. I know how you feel, the book is not an easy read. I am glad you let it be.